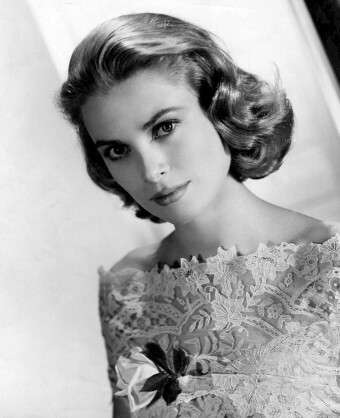 Before Princess Diana came along, the world’s favorite princess was Princess Grace of Monaco, the beautiful movie actress who married the handsome Prince Rainier III of Monaco. She left Hollywood for his picturesque principality on the French Riviera to be his princess and raise their royal children. It all did seem like a fairytale until a tragic car accident ended her life at age 52 on September 14, 1982. Grace Kelly was born into a wealthy Philadelphia family on November 12, 1929. She became interested in acting at a young age and worked as a theater actress and model in New York before making the move to Hollywood. After a string of successful movies including “Rear Window,” “Country Girl” (for which she won an Oscar), “To Catch a Thief” and “High Society,” Grace met Prince Rainier III of Monaco at the Cannes Film Festival in 1955. The Bachelor Prince was smitten by Kelly, and a few months later he happened to show up in Philadelphia while Grace was visiting her hometown. Just eleven days later, Grace and Rainier were engaged. She agreed to give up her wildly successful film career to dedicate her life to a man and a country she barely knew. So it was that in early April of 1956, Grace and her entire family set sail for her new home in Monaco to prepare for her wedding. The welcome from her new subjects and pomp of her wedding ceremony made anything Hollywood had to offer pale in comparison. The freshly minted princess settled into her role, traveling often and making good will tours on behalf of her new country. By 1965, she and Rainer had three children, Caroline, Albert, and Stephanie. Grace reportedly toyed with the idea of making a movie here and there, an idea Prince Rainier wouldn’t begin to entertain. Princesses weren’t actresses, so Grace would have to content herself with supporting local actors and living vicariously through them with her Princess Grace Foundation. On September 14, 1982, Grace was driving from the family’s vacation residence with her daughter Stephanie. And, despite constant retellings of the tale, it was not the same road shown in her 1955 movie “To Catch a Thief.” But the road was winding and narrow just like the one shown in the film. Witnesses report that Princess Grace’s vehicle suddenly began to sway as if the operator was drunk or had lost control. When the car came to a hairpin curve known as “Devil’s Curse,” it careened through a stone barrier and over a cliff to the hillside below, clipping the treetops as it crashed its way downward. When the vehicle was finally halted in its downward trajectory by a tree, 17-year-old Stephanie managed to free herself from the wreck. A local gardener arrived to help her remove her unconscious mother from the mangled car. They had to break the rear window to do so. Stephanie only suffered minor cuts and bruises, but Princess Grace sustained massive internal injuries and died 24 hours later without ever regaining consciousness. It was determined that she had suffered a stroke that caused the accident leading to her death. Princess Grace of Monaco was laid to rest in St. Nicholas Cathedral on September 18, 1982, where she had been married 26 years previously. So, on her wedding day, she was 25 years old — and she had worked in “perilous” conditions in New York and Hollywood — but she had preserved her innocence (her holy purity) for that quarter of a century. THAT is what I meant by her being a role model — for her time and for all times. Grace Kelly behaved chastely, as almost all young women of that period did (1929 to 1956) — and as all young women ought to behave today and until the end of the world. Every (first) marriage ought to be between a man and a woman who are both virgins — just as God has revealed to mankind through His innerant Word. Nowadays, because so many people in positions of influence (parents, teachers, pastors, media, and friends) are so ignorant themselves — or are too afraid to mention these true “facts of life” to young men and women (because of persecution for being “politically incorrect”), God’s will is too rarely done. How sad!